The success of I'll Say She Is! guaranteed the Marxes a second Broadway show. The Cocoanuts has music and lyrics by Irving Berlin and a book by George S. Kaufman, with additional text by Morrie Ryskind. The musical was given tryouts in Boston and Philadelphia before opening at the Lyric Theatre on 8 December 1925 and closing after 276 performances on 7 August 1926. 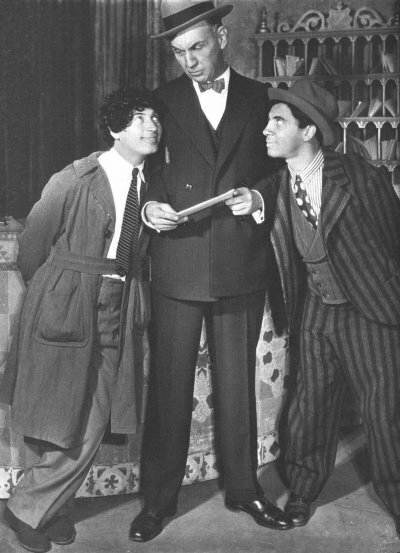 The Marx Brothers then took the show on tour. After a brief Broadway revival at the Century Theatre in May 1927, the Marxes made a vaudeville tour with an adaption of the concluding party scene named Spanish Knights. It opened at the Metropolitan Theater in Los Angeles on 9 February 1928 and toured until April the same year. The Cocoanuts was performed by a British cast in London, England as early as in 1928, and the show was also revived in 1988 at the Arena Stage, Washington D.C. The show was almost filmed by United Artists in 1928 (which would have meant a silent movie!) but instead, Paramount filmed it the year after as one of the first talkies. It reportedly ran as much as 140 minutes at a preview but was cut back to 96 minutes for the release on 3 May 1929. The print available nowadays was obviously cut together from a number of battered negatives or old prints and runs about 92 minutes. Given the poor condition of the material that has survived, it's very doubtful that any of the missing footage has survived. Zeppo has less to do here than in later films and his part may have been reduced in cutting. One moment may be traced thanks to the stage script. When the bellboys are protesting against being unpaid, Zeppo tells them that Groucho has yet to arise at four in the afternoon. His comforting postscript, that Groucho always gets up on Wednesday, precedes the manager's arrival. In his encyclopedia, Glenn Mitchell suggest that this scene was shot but deleted, as Groucho makes his entrance descending the stairs, still putting on his coat, allowing time to fend off his staff before meeting a train at 4.15. The play included several songs that didn't make it to the movie, and there was also a revision of the show in the summer of 1926 which replaced a couple of the songs. Monkey Doodle-Doo was one of the songs that survived and also was retained for the film. 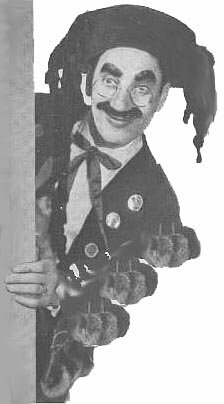 In the 1990s, the tune was converted into a Chico-item in BBC:s revival of the radio show Flywheel, Shyster and Flywheel, and Glenn Mitchell writes that George S. Kaufman's daughter Anne Kaufman Schneider were delighted when she heard that version; "That's usually a clumping chorus number and a bit of a dead spot. From now on I'm going to insist that Chico does Monkey Doodle-Doo in every revival of Cocoanuts!" Irving Berlin wrote a song named Monkey Doodle-Doo in 1913 but in an email I received in 2002, Kay Lhota points out that the 1913 song is not anything like the 1925 song, having a completely different set of lyrics and written in a different key. In the preview-length print of the film, Groucho supposedly sang the number A Little Bungalow (which, according to Alexander Woollcott, was "clever, insidious, engaging") while courting Margaret Dumont. The song is set up through Groucho's dialogue ("Ah, if we could find a little bungalow, huh....oh, of course I know we could find one, but maybe the people wouldn't get out") but the film fails to deliver. In the play, A Little Bungalow was "the inevitable duet" (Woollcott), sang by characters Polly Potter and Robert Adams. 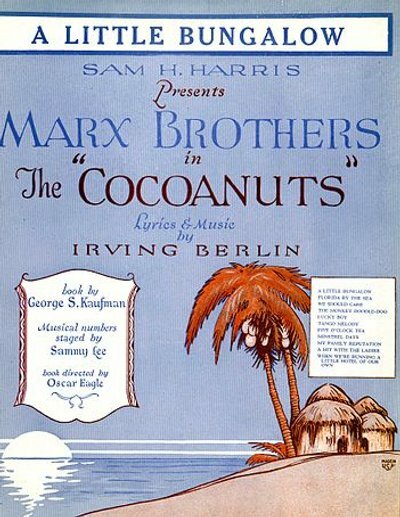 Although replaced by another Irving Berlin-original (When My Dreams Come True), The Cocoanuts has gone to history as the only Irving Berlin-play that didn't produce a hit tune. A recording of A Little Bungalow by Helen Clark and Franklyn Baur was released in 1926. Scene 1 – Lobby of The Cocoanuts, a hotel in Cocoanut Beach, Florida. Scene 2 – Before the Palms. Scene 3 – Two adjacent rooms in the hotel. Scene 4 – Before the Palms. Scene 5 – Cocoanut Manor. Scene 1 – The Lounge of the hotel. Scene 3 – The Patio of the hotel.